Today I made an "artist's apron" for Mr. S. using a dollar store dishtowel. This is perfect for a little artist standing at an easel. What little kid doesn't love pockets? And who wouldn't love having a separate pocket for each crayon? First cut 2" off each LONG side of your dish towel. These will be the ties. Next cut 2" off ONE SHORT side of your dish towel. This will be the neck strap. 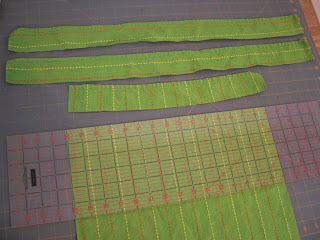 Step Two: Hem the cut side of each 2" strip, turning twice for a nice finished edge. I don't measure or pin -- just eyeball it! 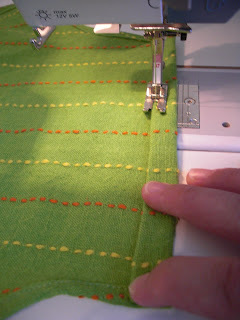 Step Three: Determine the length you want for your apron, then ADD 3". This is the length you want to cut your towel. Cut from the same edge you cut the neck strap, so you still have one hemmed edge on your towel. Then cut out arm holes as shown. I eyeballed this too. 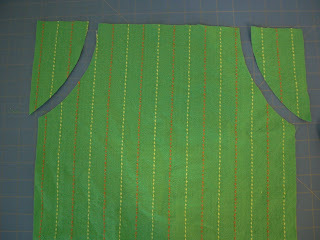 Step Four: Hem all unfinished sides. 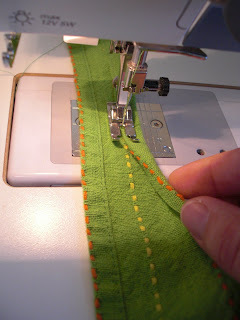 IMPORTANT: You need to turn the three raw sides to the opposite side the existing hem is on. 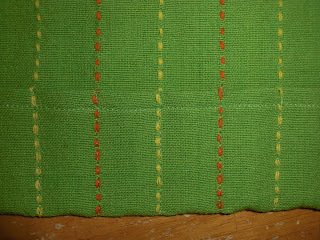 That way when you turn your pocket up, the "front" of the hem will be on the front of the apron. I did the two sides first, then turned down the top edge with a larger hem. Step Five: Fold your pocket! I folded mine up 2". 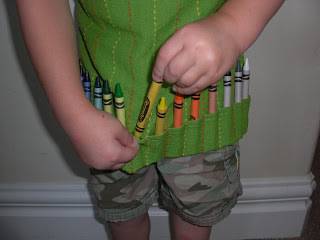 Then you will mark every 1" to create your crayon pockets. This was super easy for me, because the towel I chose happened to have 1" stripes! Step Six: Attach the straps! 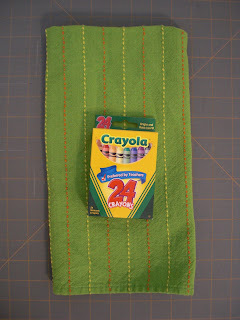 Step Seven: Fill it up with crayons, tie it on your little one, and let the art begin!! Oh my gosh, SO CUTE!! <-- that's literally what I said out loud when I saw this. Please post this on DSC!! I love the twist on the apron - awesome! Yay! This is a great Tut I LOVE it! I am wondering though what is the starting six of the tea towel you are using, it might just be my perception but it seems bigger than the typical size of tea towels here. My towel was approximately 26"x18". I'd love to see yours if you make one! LOVE THIS! I'll be featuring tomorrow. You are soooo creative! YOU are a freekin' genius. I LOVE this. This is brilliant! What a lovely idea for gifts for young artists. 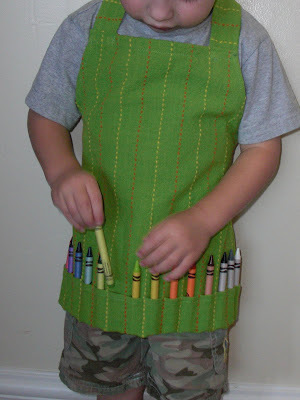 OMG cute, I need to make a couple of these AWESOME aprons! That is awesome! Thanks for sharing! I love the simplicity! LOVE this one- I'll be making a few for Christmas gifts this year- thank you!!!!!! Love this! 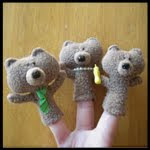 I plan to make one this weekend for my g'son starting Kinder! I love this idea, and i dont think I could express just how wonderful my kids are going to love this. I will certainly link to you when the idea is used. Love this got to go find a dish towel. Don't have a blog but will give you credit. My budding artist will love this. Ohhhh, another great project!!! So handy! 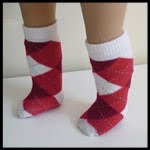 I added it to our link luv this week! It looks like you need more links to this post:) I have that exact dish towel so I must make this! 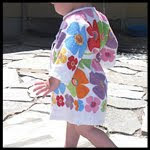 I'm featuring this at somedaycrafts.blogspot.com Grab my "featured" button! SUPER cute & SUPER quick and easy! Thanks so much for posting this! I SO want to try it now! 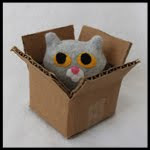 BTW, I'm now a follower - I don't want to miss your Giveaway! 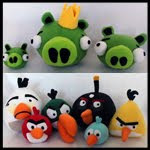 LOVE it - so creative and cute! How CUTE! I'm a super lazy bones - so now my goal is to find a dishtowel with the same stripes so it can lead the way. Thanks for sharing!!! This is adorable! I just sent the link to my MIL to see if she could make one for us! It just depends on the size of your towel. 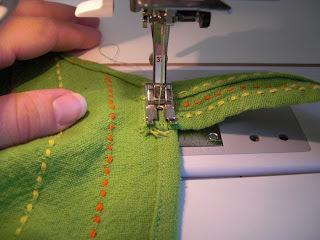 You could always use a separate towel or some cotton webbing for the straps if you need the apron to be larger. I made one tonight! It took about an hour. One word of advice - make sure your towel is as bright on the back as it is on the front! I think it's still cute. I wasn't convinced the neck hole would fit over my daughter's large head so I made a Velcro closure. Also was inspired to turn an old t-shirt into a skirt for her while I was sitting at the machine! Thanks for this tutorial. Very fun! My son LOVES pockets and crayons! He'd go crazy over this! Thanks for the tutorial. I'll be searching for some dishtowels that aren't so girlie now! what a good idea !! thanks for the tutorial ! I just made 2 for a couple of sisters. I made a slight change, I pit ribbon around the top and as the tie ups so there was no hemming to do. GENIUS, Annchan! I'd love to see them if you could send me a link or a picture! this was the perfect thing to give my kids for christmas... I made two of them the other night. Thank you so much! Merry Christmas! Thanks a lot for posting. 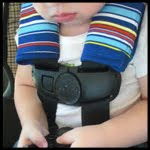 You have helped me get an idea on what to do as a project for my kids this summer. We haven't tried coloring as a big project though. I have seen forums discussing coloring books, apart from the very colorful books, I would be able to help enhance my kids' arts skills. I understand the two straps you cut for ties but I don't understand the piece you cut from the SHORT end of the towel ( chest...) and what you did with it. I LOVE this and its a great BDay present!!! nevermind...I'm a dork. I get it now.